I've been falling in love with everything plaid lately. Scarfs (like this one), shirts, pants! Have you seen these from Old Navy?! So cute! If there's one thing I love sharing on my blog, it's how to take trends and make them your own. You guys know I'm from the school of "Wear What You Like." But it's still important that while you're wearing what you like, you still have made the effort to look your best. Even though there aren't a whole lot of moving parts to this outfit, I still love it. Sometimes, simplicity is the best way to feel stylish. Give me messy hair, oversized watches and comfy jeans any day. Plus I think you can never go wrong with some Rose Gold pops. I know this plaid shirt is from last season but I've got several fun and affordable options for you try below. Happy Tuesday everyone! There's nothing I love more than a good Florida State gameday outfit. But what's even better than that? 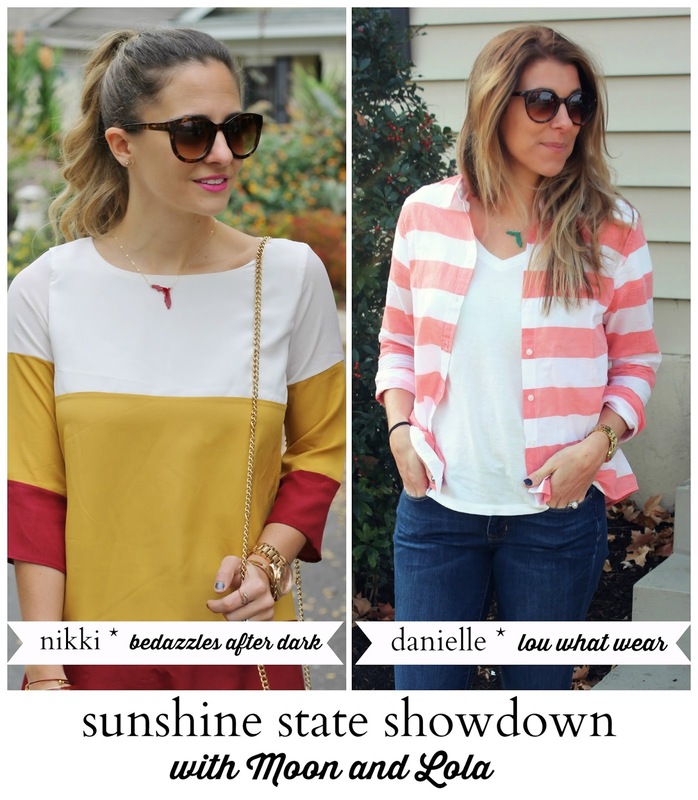 A gameday blogger collaboration with my girl Danielle over at Lou What Wear! You'll remember last year we each styled a baseball cap for the Florida State vs. Miami game. That challenge was a step out of my comfort zone, but so much fun to do. This year we teamed up with Moon and Lola for a more dainty approach and each styled their Acrylic State Pendant Necklace. It even has a heart or star cutout for you favorite city! How cute is that? I'm in serious love with our necklaces! They're beyond perfect for a Gameday Outfit. With over 30 colors to choose from, you can rep your state and school pride in just the right shade. Then, choose your city's heart cut out (Tallahassee for me, Miami for Danielle). It's the perfect finishing touch whether you're watching a football game, attending a basketball tournament, or just want to shout it out the world that you love your school and state. Shop Moon and Lola's entire state collection here. I love the way that Danielle styled hers. Don't forget to hop over to her blog to check out the full look. Don't forget to check our Twelve Saturdays for more game day apparel! They just had a major sale and I scored this exclusive blazer at an amazing price. Happy Gameday everyone! And Go Noles!! 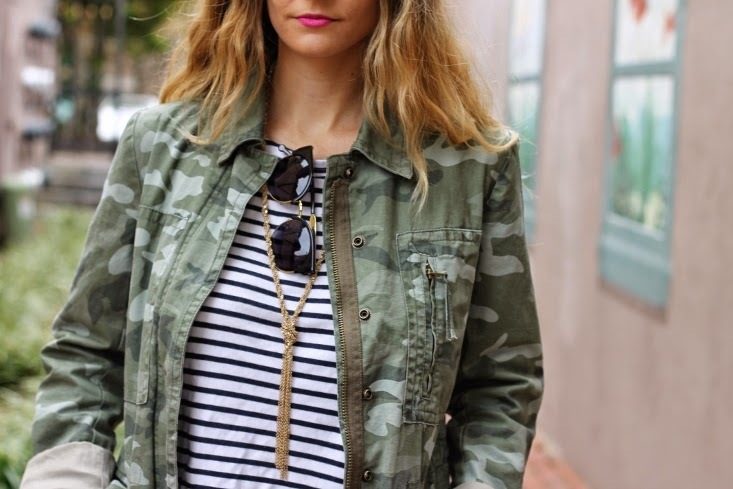 Every gal needs a camo jacket in her closet. It goes with everything and is perfect for a fall/winter outfit. I love pairing this one with mixed prints. 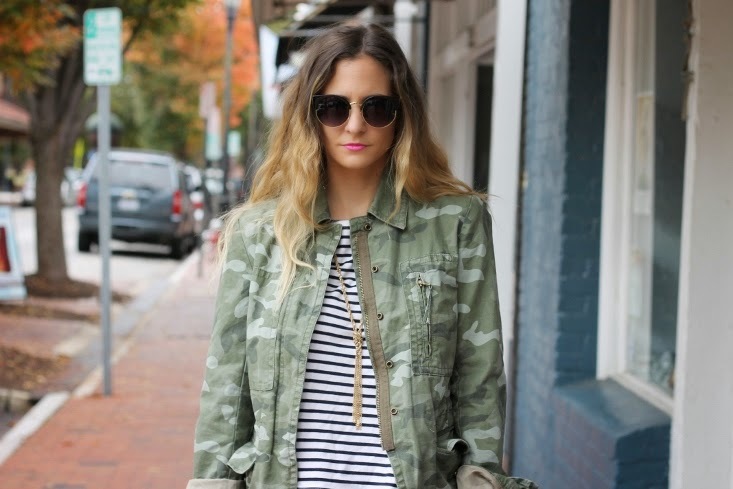 There's just something about stripes and camouflage together isn't there? And even though my jacket is from last year, this one from L.L. Bean is a dead ringer. On another note - if you're looking for some holiday gift ideas, look no further than Sole Society! With their assortment of jewelry, sunglasses, handbags and shoes, you really can't choose a bad gift option. Plus you could always do a giftcard! I love my retro inspired sunglasses. The flared semi-cat eye gives them a little something, something. Don't you agree? I think they question you should be asking regarding daytime sequins is: Why Not? They're slightly unexpected, a whole lot of fun and bump any casual outfit just up a notch or two. I wore this to work and everyone loved it. This outfit is a little bit late... okay it's a lot-a-bit late considering I instagrammed it on September 30th. But we'll just overlook that fact... hey it's been a busy couple of weeks #IRL. My job is amazing and I absolutely love it. But since going back to work full time, I haven't been able to devote as much time to BAD as I did before. But we're still chugging along so I hope you'll come back for more outfits and inspiration.